The Iranian regime appears to be in a panic as the Trump administration tightens the screws on the country’s economy with the United States telling countries to stop all oil imports from Iran starting on Nov. 4…writes Ariel Ben Solomon/JNS. In the meantime, the United States is asking the Gulf states to boost their oil production to make up for the Iranian shortfall. The question is if this, and other economic sanctions and pressure, will be enough to increase the protests inside of Iran? Dr. Harold Rhode, a former adviser on Islamic affairs in the U.S. Department of Defense and now a distinguished senior fellow at the Gatestone Institute think tank, told JNS in an interview that from the perspective of the Iranian people, the radical regime is reacting to the protests from a position of fear. “The protesters have confidence because they inherently sense that the regime is weak,” commented Rhode, adding that as long as the regime is perceived to be strong, the protesters will be more careful and reserved. Protests have criticised the Iran regime and its foreign policy of imperialist expansion in the region, which they say is happening against the interests of its own citizens. 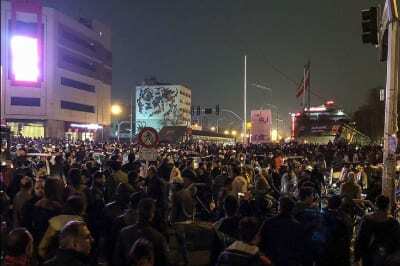 Regarding the significance of protests in Tehran’s Baazar, Rhode said that keeping control of the central market is a key indicator of the power of the regime to control the rallies. The former Pentagon official sees the pressure and sanctions strategy of U.S. President Donald Trump—one that has been pushed for years by Israel Prime Minister Benjamin Netanyahu during the Obama administration—as having a chance of succeeding and leading to regime change. As a result of the recent U.S. withdrawal from the nuclear deal and the new pressure campaign initiated by the Trump administration, reports keep coming in about how deals worked out during the Obama administration are falling apart. For example, in early June, Boeing said it would not be delivering any aircraft to Iran after having signed a pair of large contracts with Iranian airlines, AFP reported. Raz Zimmt, an Iran expert at the Israeli think tank INSS, told JNS that the recent protests in the Tehran Baazar is the latest link in the wave of protests that have gripped Iran in recent months. However, Zimmt also warns against observers who are overly optimistic about the possibility of the regime falling, mentioning the limitations that the protest movement faces. “Most of the demonstrators, including the merchants at the bazaar, focus on improving the economic situation against the background of the worsening crisis and not toppling the regime. Therefore, “the protest currently affects mainly the status of President Hassan Rouhani and the government and poses no real threat to the stability of the regime,” asserted Zimmt.